I find ‘Filigree Lace’ to be an very interesting Japanese maple. 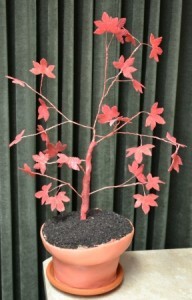 Although a member of the dissectum family, this particular maple appears to be unique to most dissectums. It has a lime green color, deeply cut leaves, and even though it is a weeping variety, it does appear to grow upright, then cascade. The current photo that I have isn’t spectacular by any means but the only plant that I have is quite small. I’ll get some better photos soon. I’d be interested, I’ve got shade houses at my shop that get tarped in the winter.